March 6th, 2015, Charlottetown – Just days after returning from the Canada Winter Games in Prince George, Miriam Burnett was the top female skater at the Citadel Cup short-track speed skating competition held in Halifax recently. Miriam Burnett captured a gold medal for P.E.I. at the recent Citadel Cup short-track speed skating meet in Halifax. The medal was one of four earned by Island skaters at the event. Photo courtesy of Kevin Scott. 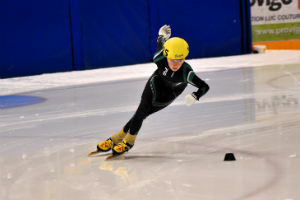 The Charlottetown skater bettered her own provincial record time in the 1500 metre distance to help earn her top spot on the podium. The gold medal result followed up on a strong Canada Games showing where Burnett was the youngest member of the Island’s short-track team. Also snagging medals for the twelve member Island contingent were William Lyons of the Eastern Kings Speed Skating Club and Rob Binns of Stratford with silver medals, while Kristen Binns took home a bronze medal. Kyle Connell set a new provincial record mark for 12 year-old boys in the 200 metre sprint, improving on his own record time set last November. Rob Binns also set new P.E.I. records at the Halifax event, with new standards for Masters (40+) in the 500m and 1500m distances. Andrew Binns posted the fastest times and was the top finisher among P.E.I. skaters, with a 4th place finish in the top division. Along with Connell and Burnett, Binns was among 16 competitors in the fast division which included six Canada Games team members and two Canada Games medal winners from across the Maritimes. Also competing for P.E.I. in Halifax were Matt Kozma, Jenna Larter, Matthew McKenna, Liam Chatfield, Zachary Chatfield and Anderson Arseneau. Kozma, McKenna, Zachary Chatfield and Arseneau each had a pair of personal best times at the meet. Over 80 skaters from ten Maritime clubs participated in the competition, which was the final event of the season on the Atlantic circuit. Ten P.E.I. skaters are now gearing up for major end-of-season events. Jared Vriends and Carly Connell will represent P.E.I. at the Canadian Junior Open #2 in Toronto from March 19 – 22, looking to earn points toward national Junior rankings. Meanwhile, eight of the Island’s best 11 to 15 year-old skaters will represent P.E.I. at the Canada East Short Track Championships in Fredericton on the same weekend. They’ll be taking on the best skaters from Ontario, Quebec, the Atlantic Provinces and Nunavut in their respective age classes. Leading P.E.I.’s Canada East contingent will be Peter McQuaid and Miriam Burnett. McQuaid, like Burnett, is coming off a successful Canada Games, where he logged a top 20 finish in the 49 skater field, despite being one of the youngest skaters in the Games.